It was in the year 1955. Bombay city was an attraction for job seekers, as it is even today. Some believers belonging to the Indian Pentecostal Church of God in Kerala had come to Bombay in search of jobs. Three friends joined together on a Sunday at the residence of Mr. T.M. Abraham (Karamvelil Avarachan) in Building No. 1 of Tilak Nagar, Chembur and formed a small prayer fellowship. The group continued to meet regularly on Sundays at the same place and slowly grew in size bringing to its fold people from various Christian denominations who made personal commitment to Jesus Christ as their Lord and Saviour and who believed in the Pentecostal experience of the baptism of the Holy Spirit. 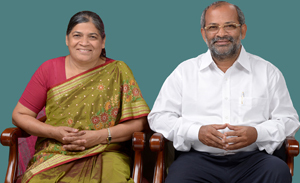 The prayer fellowship decided to organize itself as a local church of the Indian Pentecostal Church of God and was helped initially by Pastor Kurien Joseph. The first Pastor who was sent from the Headquarters in Kumbanad to minister in the church was Pastor C.J. Mathew in 1956 who had just completed his Bible training and had a vision for North India. He ministered in the church for two years and moved on to other places. As the membership of the church grew to about 25, it became difficult to continue the worship meeting in the same small room in 1, Tilak Nagar. The service was shifted to a class room of Elizabeth School, Chembur in 1960. The church continued to expand as it became a source of blessing to many young people who came to Bombay to work in offices, factories, hospitals, etc. Many members of the church moved to other parts of the world over the years. (One would be able to meet old members of IPC Chembur in various states of North America and the Gulf countries). At the same time, many more kept coming to its fold, too. The class room became totally inadequate for the purposes of the church as the attendance in the worship meeting exceeded 100. Special meetings had to be held outside the class room in the school compound or in other open grounds. People began earnestly to pray for a new and bigger place of their own. A whole hearted effort to collect funds for a hall and parsonage began in 1975. Members pledged to contribute at least one month’s salary to the building fund of the church. Appeals for funds were sent to friends in different parts of the world. Encouraged by the generous response a decision was made in faith to buy a hall and a parsonage in the ground floor of Ballena, a proposed building in Chhedanagar, Chembur although the funds were inadequate at that time. The construction process of the building was very much like an “obstacle race”. We could feel God’s intervention in the matter several times. May His name be glorified. Finally the premises of the church was completed in December 1977 and the hall was inaugurated on Sunday, December 11, 1977 with a worship meeting in the morning and an inaugural function in the evening. The hall has a seating capacity for 250 people. A baptistry is constructed at one end of the hall which, with the cover on, serves also as a platform. 1. IPC Ebenezer, Coimbatore, since 2009 to April 2013. 2. IPC Bethel, Sana’a, Republic of Yemen, 2005 to 2009. 3. IPC Hebron, Pune, 2004. 4. IPC Hebron, Athaani, Thrissur, 2002 to 2004. 5. IPC Hebron, Kuttanallur, Thrissur, 1996 to 2002. 6. IPC Thabore, Koottala, Thrssur, 1993 to 1996. 7. IPC Philadelphia, Valakaavu, Thrissur, 1990 to 1993. 8. IPC Philadelphia, Chalampadam, Thrissur, 1986 to 1990. 1. Nelliyampathy, Palakkad, 1984 to 1986. 2. Operation Mobilisation in India, Kerala & Karnataka, 1980 to 1981. 3. India Every Home Crusade, Kerala, 1977 to 1978.